Jasper Johns was an artist that came onto the scene in the 1950s. Much of the work that he created led the American public away from the expressionism form, and towards an art movement or form known as the concrete. Johns initiated a dialogue with the viewer and their cultural context through his artistic exploration of how people see the things around them. In New York, Jasper Johns befriended artists Robert Rauschenberg, Merce Cunningham, and musician John Cage. Together Johns and Rauschenberg explored the contemporary art scene and began developing their ideas on art together. Robert Rauschenberg would have a huge impact on Jasper Johns and his art. Our Fine Art Gallery has the finest quality Jasper Johns original prints and lithographs for sale. We encourage you to make an appointment to see specific works you are looking to collect. We are happy to meet you at either our art gallery showroom or at your home or office for a private presentation. Jasper Johns was born in Augusta, Georgia on May 15, 1930, but spent most of his childhood in South Carolina. Between 1947 and 1948 Jasper Johns briefly studied art at the University of South Carolina, but moved to New York City in 1949 and enrolled at the Parson’s School of Design. Jasper Johns earned a living decorating window displays and working in bookshops. Jasper Johns’ early works of art were composed of the American flag, maps, targets, and also numbers and letters. Similar to Robert Rauschenberg, Jasper Johns utilized the ambiguity of symbols in a consumer society as a central motif in his art. Jasper Johns is famous for incorporating such media as encaustic and plaster relief in his art. Jasper Johns’ art is often described as a Neo-Dadaist, as opposed to Pop Art, even though Jasper Johns’ subject matter often includes images and objects from popular culture. Still, many compilations on Pop Art include Jasper Johns as a pop artist because of Johns’ artistic use of classical iconography. In 1958, gallery owner Leo Castelli discovered Jasper Johns while visiting Robert Rauschenberg’s studio. Castelli gave Jasper Johns his first solo show, where Alfred Barr, the founding director of New York’s Museum of Modern Art, purchased four works of art from Johns. Jasper Johns’ concern for process led him to printmaking. 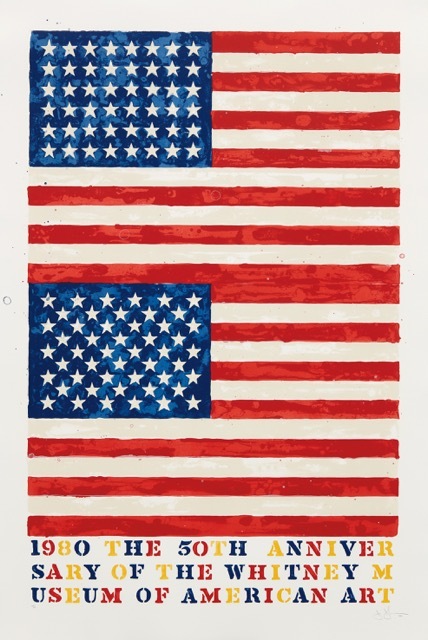 Often Jasper Johns would make counterpart prints to his paintings. For Johns, printmaking was a medium that encouraged experimentation through the ease with which it allowed for repeat endeavors. Jasper Johns’ innovations in screen printing, lithography, and etching have revolutionized the field. Between 1960 and 1970 Jasper Johns developed four distinct motifs of the numbers subject: Figures, Numbers, 0-9, and 0 through 9, Creating lithographs and etchings, each motif was a variation of the number sequence zero through nine set into a rectangular field. In Numbers, Jasper Johns developed a grid format of repeating rows of the ten digits. For the 0-9 motif (also called Ten Numbers) Jasper Johns created an abbreviated grid of ten rectangular units in two rows of five. Finally, in the variation 0 through 9, Jasper Johns superimposed all ten digits in a rectangular field one on top of the other. Over the past fifty years, Jasper Johns has created a body of rich and complex art. His rigorous attention to the themes of popular imagery and abstraction has set the standards for American art. Constantly challenging the technical possibilities of printmaking, painting, and sculpture, Johns laid the groundwork for a wide range of experimental artists. Today, Jasper Johns remains at the forefront of American art, with work represented in nearly every major museum collection. Today he lives and works in Sharon, Connecticut and the Island of Saint Martin.